Random header images have returned to our Summitlake.com Home Page. That’s the page-wide banner image at page top. Home page visitors see a new image with each visit. We select these at random from a collection of about 40 custom images. I created these from my library of personal photos, including many not posted elsewhere. Visitors to other departments continue to get a static image (it never changes) which helps visually to determine what department we’re currently viewing. The rest of this article contains an image displaying what those iconic department images look like, and technical details mostly of interest to WordPress geeks. I hope you enjoy the 40 or so new custom Home Page header images. I created them new from Photoshop crops of the my favorite personal library images. 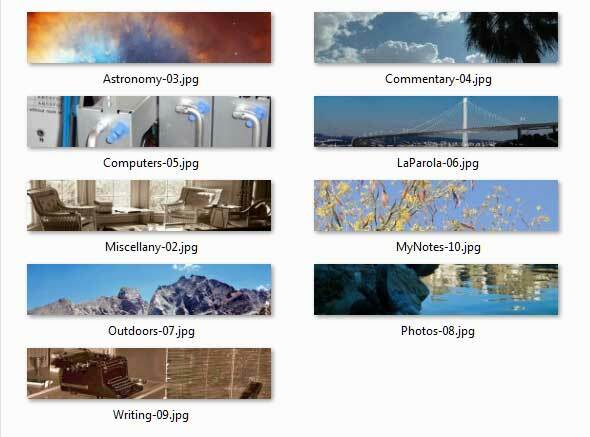 The image below displays the static banner header images for our nine satellite “departments”. The Astronomy header photo is from a NASA image of the Helix Nebula. All other banners currently used on this site are crops from personal digital photographs and 35mm slide scans. (No image is shown below for HOME as it’s the department with rotating random images.) All personal images are copyright, so it would not be cricket to post these images elsewhere. Random banner images are built into WordPress as of version 3.2, eliminating the need for custom programs and plug-ins. I’m super-pleased to have developed a master Perl script for deploying the new WordPress builds that get released every few weeks. It’s an enormous time-saver. It relieves me of the one time-trap chore I absolutely hated, which was FTP’ing the builds to each of my WordPress departments. Since some of this article is of general interest, and some is probably only interesting to Perl geeks, I’ll divide the article into General and Technical parts. I posted an article in my Notes earlier this morning called “Schrödinger’s Cat and Less Famous Felines“. This is not so much a shameless plug for my article as an observation that we do not really have a WordPress home for articles of a scientific orientation. Articles on cosmology end up, naturally enough, in Astronomy, while articles on computers and Silicon Valley type technologies go here. Most of everything else touching on scientific progress goes into My Notes. Speaking of upgrades, there’s a new version of WordPress out. What is WordPress? If you read the papers, web or other media, think “blog”. Websites are using weblog engines for many other purposes than weblogs. This page is composed in WordPress online, and its parts are stored in a mySQL database. The installation outage took less than half an hour tonight, ending at about 945PM PST. Our apologies if you encountered the outage during this time span. WordPress 1.5 has been written with stronger firewalls and comment handling against spam. We are cautiously turning on Comments again. The first time you submit a comment, it will be queued for moderation. If approved, you are approved for subsequent comments. Please expect a delay of up to 24 hours before you can see your first posted comment. We left the MovableType system right after investing so much energy setting it up. The MT people are fine folks and we wish them well. I do not want to leave this site hanging while they sort out licensing issues that, in effect, would have this free site paying by the page to use their technology. WordPress is free, easier to set up, and user friendly. It has been described as being a bit rough around the edges. There are some obvious areas for development in future releases, but they are mostly of concern to webmasters and not noticeable to most users. We have already made a donation to WordPress to help them support this fine product.